Poor communications and access difficulties are still hampering relief efforts in the wake of Typhoon Haiyan, which made a devastating landfall in the Philippines on Friday. The typhoon has affected close to 10 million and left more than 500,000 displaced, according to the National Disaster Risk Reduction and Management Council (NDRRMC). On 11 November it reported 255 deaths from the storm, while local officials put the figure in the thousands. The government has already called for international aid and now Department of the Interior and Local Government Secretary Manuel Roxas II has appealed to the private sector for help. “Please send technical experts and volunteers; particularly those capable of extending assistance in restoration of communication lines and power and water supply, clearing of debris, and medical assistance,” Roxas said. According to NDRRMC, over two million families (nearly 10 million individuals) in 41 of the country’s 82 provinces were affected by Typhoon Haiyan, locally known as Yolanda, and the most powerful storm to make landfall since records began. Over 28,000 homes have been damaged or destroyed. As of today, of 584,642 are displaced, with 319,868 in evacuation centres and 264,774 staying with family and friends, according to the Department of Social Welfare and Development. Prior to the disaster 748,572 people in 31 provinces were evacuated, but some in less affected areas have been able to return home. Flights from Tacloban City, Roxas City, Busuanga and Kalibo are suspended, with commercial flights not expected to resume for at least two weeks. The UN Office for the Coordination of Humanitarian Affairs (OCHA) says a round trip on the 11km road that connects the airport to Tacloban city currently takes six hours. 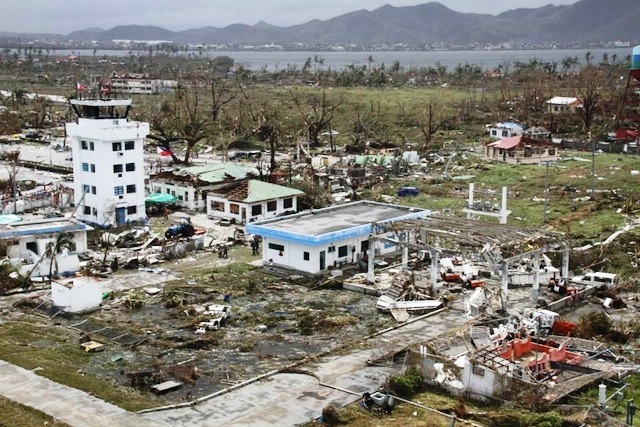 The medical charity Médecins Sans Frontières (MSF) reported it had yet to assess the full extent of the needs as the airport in Tacloban City had been destroyed, many of the roads were blocked and it was almost impossible to make telephone calls from either landlines or mobile phones. “These conditions will inevitably hamper the needs assessment and delivery of humanitarian aid,” the group said. ICRC supplies pre-positioned on the southern island of Mindanao two days before the typhoon have yet to reach Tacloban, believed to be the worst-hit city after it was lashed by seven-metre waves. ICRC had 11 trucks stranded in Surigao City in nearby Mindanao island, loaded with food and other essential relief supplies such as hygiene kits, kitchen utensils, jerry cans, tarpaulins, water bladders and water-treatment units, emergency latrines and medical supplies. “We don’t know when our trucks would make it to Tacloban… We are looking at our options,” said Messoudi. The military’s three C-130 cargo planes (each doing two runs a day from Manila to Tacloban) are providing the fastest way to bring in necessary personnel and equipment. The government has prioritized sending in personnel to fix communication lines, security forces to restore order in communities affected by looting, and military engineers to repair bridges and roads and engage in search and rescue. Col Medardo Clarito of the 525th engineering combat battalion said they were ordered to prioritize Tacloban City. “Our priority is search and rescue and clearing operations,” he told IRIN.